The Turks and Caicos Islands is famous the world over for its sandy white beaches and pristine turquoise waters. In fact, Grace Bay beach, the crown jewel of the island located in northwest Providenciales, was voted one of the top beaches in the world by the 2019 Trip Advisor’s Traveler’s Choice awards. Big Blue Collective has shared the beauty of the sea with others for over twenty years. The company is dedicated to shrinking its carbon footprint and is active in its efforts to provide amazing tour experiences with the least amount of impact to the environment. It’s easy to relax on Grace Bay beach. But if you’re looking for adventure, look no further than a tour or excursion to get your hearts racing! Between January and April, Humpback whales make their annual migration from the Atlantic waters to Caribbean waters to make and to give birth. As a result, whale watching tour excursions are very popular during this time of year. There are several options to consider when choosing a whale watching tour. For the adventurous types, consider a snorkeling or diving trips. For families,the Caicos Cays cruise or a private charter is another option. While whale watching is a majestic experience, there is no guarantee they will appear. Individuals are encouraged to be careful when interacting with whales. Big Blue Collective offers a dazzling array of excursions that bring you and your family close to the sea. The company offers snorkeling tours throughout the day, including a cruise at sunset to the glowworm-illuminated night tour. For those looking to go a little deeper into the ocean, a diving tour may be your best bet. Looking to experience the environmental beauty of Turk and Caicos? 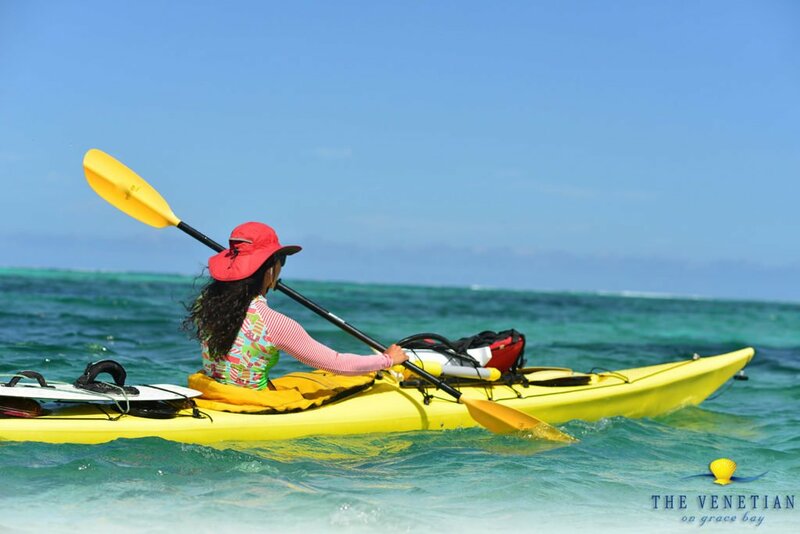 Stand Up Paddle Boarding and traditional kayaking tours are an ideal way to experience the island’s mangrove ecosystem, which protects the island’s marine life. There’s even a Kayaking and Snorkeling tour as well as a SUP and Snorkeling Tour that allows you to experience the best of both worlds! The Venetian on Grace Bay would be happy to help you connect to your perfect excursion during the course of your stay. If you’re ready to plan your adventure excursions, please do not hesitate to contact us !